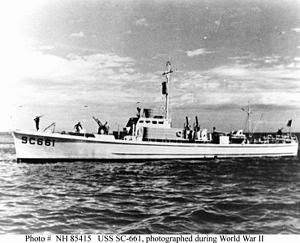 Photo of US Navy submarine chaser USS 661, sister vessel to USS SC 541 which became USCG Air Drake, then the Bahamian mailboat Drake in the 1950s and 1960s. EARLY CAREER: Served in the US Navy during World War II, 1942 – 1945, then US Coast Guard. Sold in 1948/9 to Thorton & William Lawson of New York, NY, as the 123-ton fishing vessel Drake. In 1954 sold to the Crosland Fish Co. of Marathon Fla. and based at Key West as the Drake. In 1956 sold to Bahamian ship owner Sir George W. K. Roberts, who had brought the two sister ships M/V Air Pheasant and M/V Air Swift. The Drake was then flagged to Nassau, Bahamas. OWNERS: Sir George W. K. Roberts, Nassau Bahamas (before him USN, USCG, Lawson, Crosland, per above “Early Career”).